Stourbridge according to his profile, so a UK car. I can't say I have any answers to help though I'm afraid! I might be wrong but I thought that even the SD sat nav versions come with a sim slot. I think Nick you may need to take the car into the dealership.. Confused by how the remote locking etc works fine though if its not via a sim card? Maybe a call to Audi or the dealer then! The remote locking works through the build in SOS sim, as far as I understand it. The eSIMS head will just have a Sims slot between the two SD cards and there will be an internal one. Can you get to a data plane within MyAudi? This is my MMI but why does your glove box look different to mine or are my eyes playing me up already? As far as I can tell, I don't appear to have a sim installed on mine (only had the car a couple of days so still trying to get to grips with it all and figure out what is what) but I can access things like Weather and the football results but when I tried to download the Map Update via the car it gave me an error message which suggested to me that perhaps something is a miss. I would have thought if you can see the weather and news from the mmi then you have built in sim card. The error with performing a mmi upgrade to the maps may well be down to something else, such as Audi's servers. If you can see a strength bar in the display for the data connection then you have a data connection. Thanks - I'll try that when I get back to the car... I suspected it was me as like you say, I definitely have a connection. If you go into the telephone menu then right click on the wheel you should then be able to scroll down to connection manager. Thanks. I did manage to update the map directly in the car. I noticed in the menu that there is in fact a sim installed. Going to take a few weeks, maybe months until I figure out the car. Did you see my picture Nick and the question? Only had mine last Friday so maybe the latest MMI dont have external sim? But at least youve been able to connect! I take it you linked your car's VIN to your MyAudi account? Did you also enter the 10 digit key fob code into your MMI? 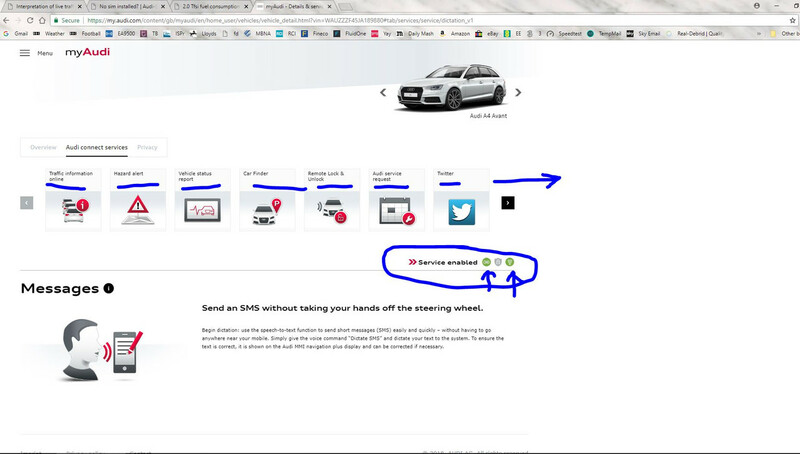 Really weird that you don't have an external SIM card; if that's a balls up by the Audi factory -which is not unheard of - you have every right to get Audi to put that right. If I was in your shoes, I would take the car to the dealer ASAP and not leave their premises until they fix it. Don't let them fob you off over the phone!! Always good to while away the time waiting for an x-ray. So you don't have a little '+' on the right of your screen when you get to the relevant part of the MMI? No keyless entry is a cost option, only keyless start is standard. I think I have done all I can so a trip to the dealership I'm atraid. Whats in the section called Audi Connect User Management? So even though I have the app features like remote locking and status report I dont get any weather, traffic data and what ever else a non-nav car should get?